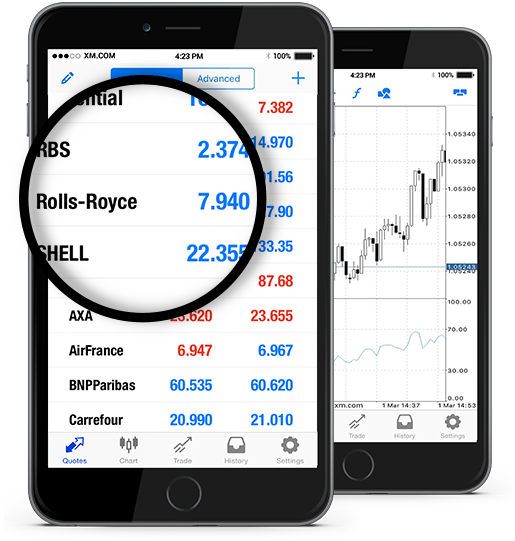 At XM we offer Rolls-Royce (RR.L) stocks as cash CFDs. Our cash CFDs stocks are undated transactions that aim to replicate the cash price of the underlying stock, and so they are adjusted for any relevant corporate actions. Risk warning: FX and CFD trading involves a high risk of loss. The prices on the images above are for illustration purposes only. Rolls-Royce Holdings plc is a multinational holding company that designs, manufactures and sells power systems for aviation and several other industries, its products including civil and military aero engines, power generation equipment, and marine propulsion systems. The company is the second largest aircraft engine manufacturer in the world. Rolls Royce Holdings plc is a FTSE 100 composite. Its stock, RR.L, is traded on the London Stock Exchange. ** Min. level for placing pending orders at a current market price. *** Note that the maximum trading volume for Rolls-Royce per client is 833 lots. This limit will be reviewed on a daily basis and updated according to the value of the instrument. How to Start Trading Rolls-Royce (RR.L)? Double-click on Rolls-Royce (RR.L) from the “Market Watch” to open an order for this instrument. If you do not give your consent to the above, you may alternatively contact us via the Members Area or at support@xm.co.uk.